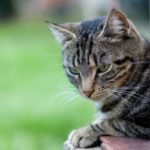 If you have an outdoor cat, you likely have been recognizing him wandering all around the neighborhood, kicking butts of other tomcats on the way, raiding trough trash bins and signing serenades to cat ladies on balconies. And, if you are at least tiny bit like most other human being, you’ve probably wondered how far your cat might have walked on his journey? Was it the fish shop over the corner or the central mall miles away? 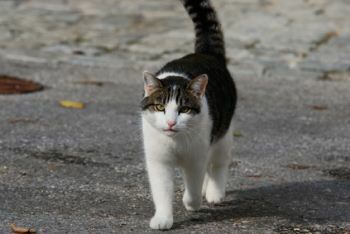 Let’s find out how far do cats roam, as well as how many miles a cat walks during the day. Research shows that area, through which cats travel, varies greatly depending on the environment, availability of food and mating partners. For example, distance a cat would not be the same in New York City and in bushes of Australia, right? Male cats are reported wandering anywhere from 2.1 acres up to 1038 acres in the wild environment. 153 acres for male cats. If we assume those areas circular with a cat’s personal territory (your house e.g.) 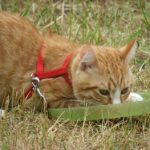 in the center, this means male cats on average wander 500 meters (or 1500 feet) away, while female cats are less curious – they walk approximately 230 meters (or 750 feet) away from home. However, in the real life, those territories are never circular, and distances how far cats roam will still vary highly, depending on the area, spay/neuter status of the cat, food available, the cat’s personality and other factors. How much do cats walk during the day? 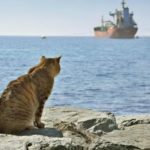 From another point of view, we also have studies that show cats normally travel from 70 to 850 meters (up to 930 yards) per day on their own feet. We can assume that most outdoor cats would cover distances somewhat in between, and not much longer that 850 meters. Of course, we also have some extreme cases, where cats travel miles and miles from their new home, back to their old ones, or, in extremely rare cases, in a different direction. For example, a cat named Sugar had been reported traveling 1500 miles (2500 km) when his owners moved to their new home, and left the cat behind. Cat followed and found his owners more than a year later. How he did this, no one has a clue, but it calculates the cat traveled roughly 4 miles per day. Of course, while this case, happening in 1950s, is a rarity and a story everyone rises their eyebrow for, other stories about cats traveling several hundred miles or kilometers for a reunion with their owners are popping up in the news every now and then. But that does not give us idea how far cats normally roam. 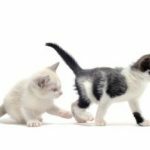 Are there behavior differences between male and female cats?